Announcements and information on special events. The NeoVictoria Project presents “Wild Hunt for a Bad Robot”. 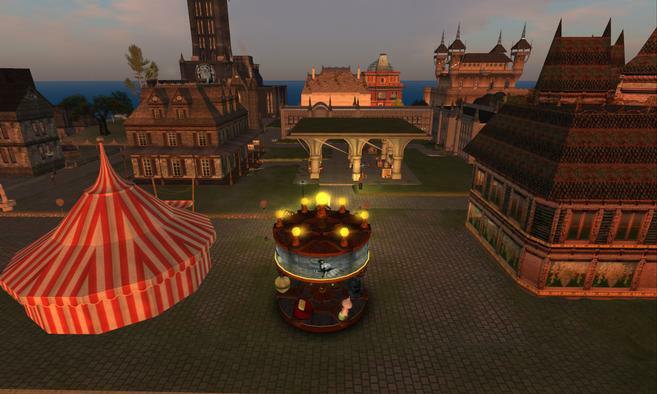 Five evenings of non-stop roleplay, marking the NeoVictoria Project’s fourth year in Second Life! This series of roleplay events begin on Monday, 22 September 2014, with a call-to-arms that all NeoVictorians find, subdue and bring to justice mad Professor Timmon’s creation. We conclude with a celebratory party on Friday, 26 September 2014. In NeoVictoria, we do free-form dark roleplay. Free-form means there is no script; scenes evolve out of real-time character interactions. Dark roleplay means that characters often act in aggressive, predatory, criminal and/or plain uncomfortable ways. We use a simple dice-based wearable HUD called the Jade Kreations Role Play Tool Suite; avatars must wear this to see roleplay chat. The item is free and available in the out-of-character skymall. Have you seen this robot? Event Description: The healer bring the townfolk together to hunt the robot down. Event Description: Cerridwen has cast thousands of runes since her systems were infected; has she finally found a permanent solution to the mote infestation? Event Description: Timmons has said his goodbyes to the robot he made, and has come up with a solution to neutralize its damaged intelligence. Will the hunting party be able to deliver it before the robot’s borrowed motes create a disaster? Event Description: Armed with a way to subdue the robot, the NeoVictorians again take to the streets and sewers to hunt the creature down. Event Description: The NeoLondon Times will sponsor a celebratory party when the robot is re-captured. A bit about our storyworld: in the Neo’Verse, the Sidhe (fae) never faded, but worked with … some would say ruled over …their human charges until the Sidhe Empire spanned the known universe. So many races exist: faeries, demons and clockwerk constructs (powered by gears and magic), humans, vampires, werebeasts and celestials. All held against the ravages of time by magic, intrigue and human ingenuity. Celestials you will find and other servants of the Light. But always, there is the balance. So gentle traveler, as you walk the streets of NeoLondon, be wary …for the sky is dark and the fair queen is far away. Art for “Wild Hunt for a Bad Robot”.